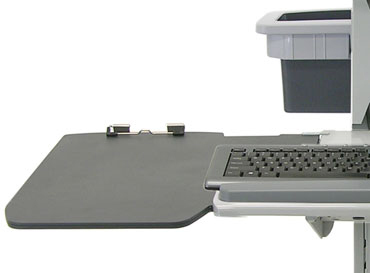 Expand the work surface on any Neo-Flex Mobile WorkSpace cart. When it’s not needed, tuck it away in the on-board storage hanger. 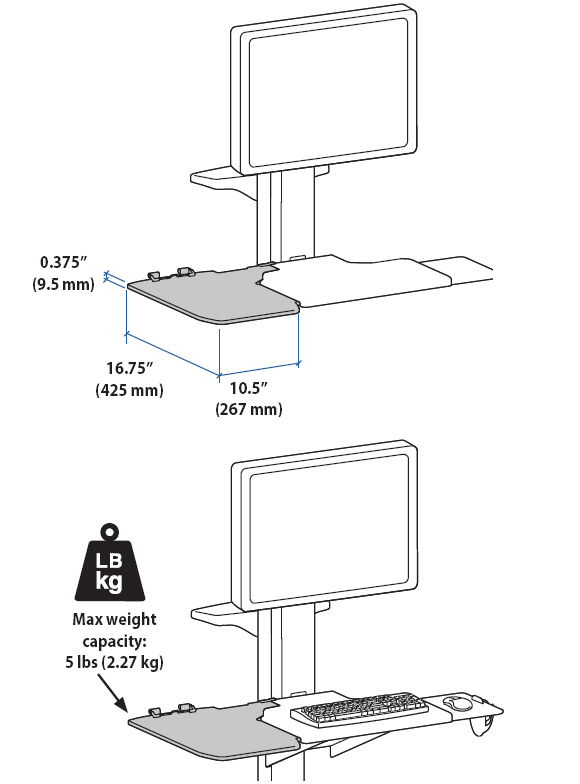 This worksurface extension installs in a snap on either the left or right side of cart. Internal mouse tray of NF cart will not retract during use of extended worksurface. When installing storage hanger onto NF WorkSpace carts purchased prior to April 2009, four (4) holes must be drilled into cart. See installation manual for details. 1. Extend the worksurface for added productivity. 2. Tool-less snap fit: Unsnap worksurface and easily slide it into storage area when not needed. 3. Smooth surface and edges make it easy to clean. 4. Robust design ensures many years of service. 5. Smooth surface and edges make it easy to clean. 6. Integrated document holder clip. 7. Attach one or two Extended Work surfaces on a cart. 8. Versatile design: Add to left or right side of cart to accommodate workflow or user preference.